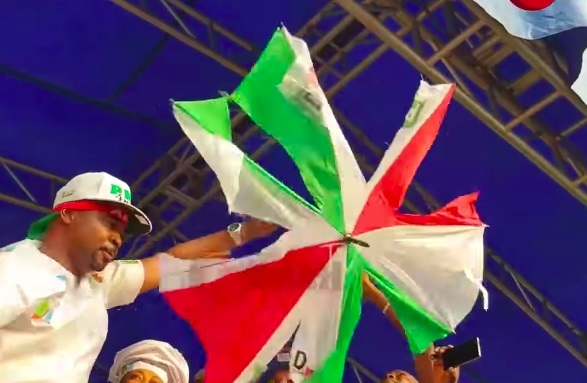 A leading member and supporter of the All Progressives Congress, MC Oluomo has been caught on tape destroying PDP umbrellas with a knife. Popular APC Supporter and executive member of the National Union of Road Transport Workers, NURTW in Lagos, Musiliu Akinsanya popularly known as MC Oluomo has mocked the Peoples Democratic Party, PD, destroying umbrellas with knife. A video has surfaced online showing him barking threats and using a knife to destroy branded PDP umbrellas. Many have called on the DSS to arrest him for inciting violence.